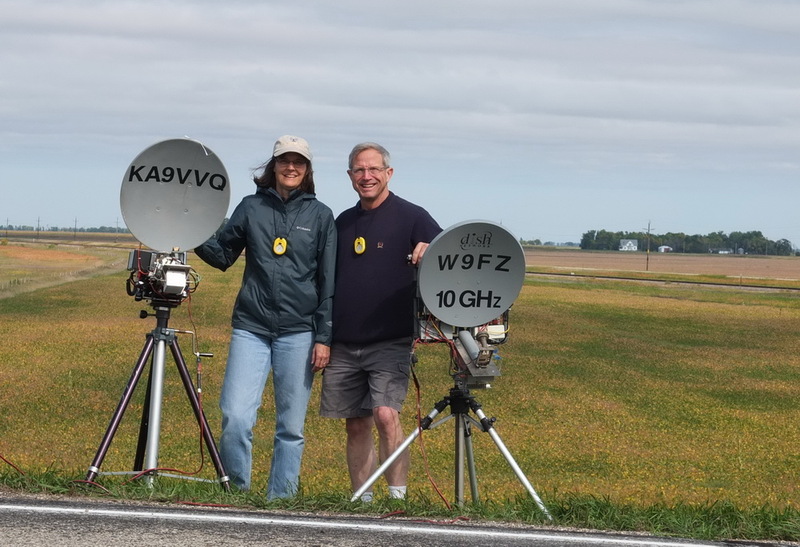 The August weekend of the 2018 ARRL 10 GHz and Above contest was spent on Minnesota's north shore of Lake Superior as part of a regional expedition to the lake. 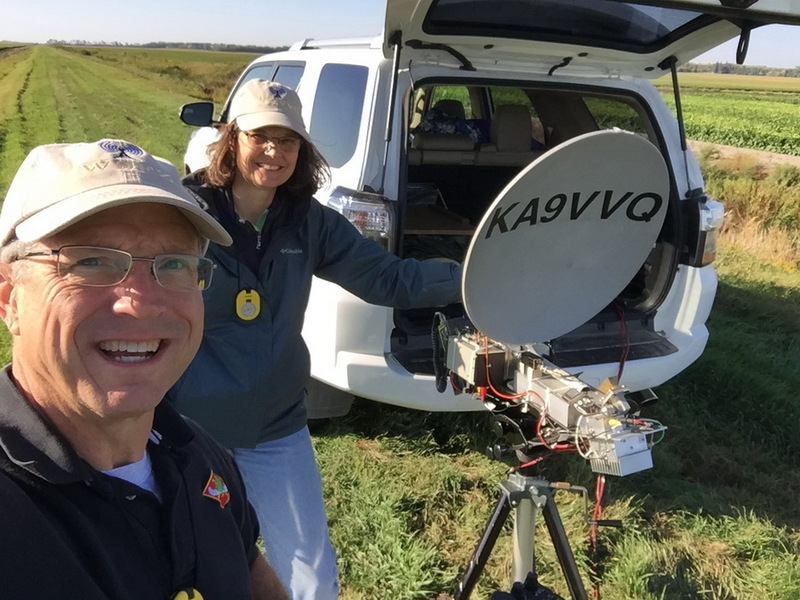 For the September portion of the contest, Janice and I initially considered roving through northwestern Illinois and northeastern Iowa. 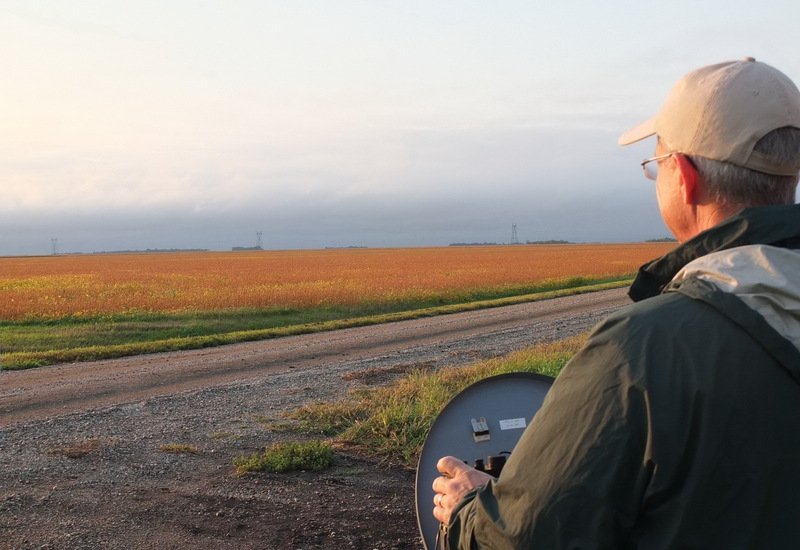 Instead, we joined in with many others in focusing on the Red River Valley which lies along the border between Minnesota and North Dakota. The Red River Valley is flat. It is the site of the glacial Lake Agassiz. Farmers have long grown sugar beets and potatoes in the Red River Valley. On this trip, we found much more corn than we expected. I suspect that ethanol production has skewed the marketplace. For 10 GHz activity, we don't like corn because it's tall enough to block our view. 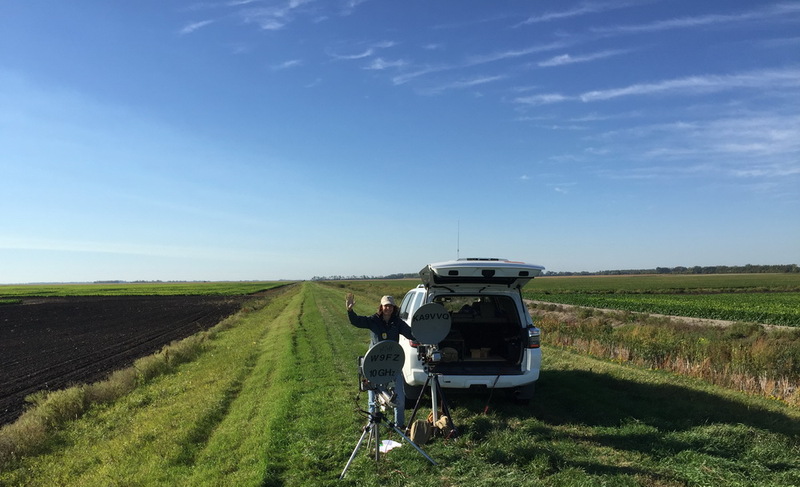 We much prefer soybeans and sugar beets because they only grow about 18" high and we can see across them with our 10 GHz dish systems. Farmers have grown many windbreaks, over the past 50 years, but we find that we can get far enough back from them that they don't seem to block our signals. We pre-located on Friday to Fargo, ND. We researched where we would operate first thing on Saturday morning. We were blown away by the growth in West Fargo! Mile after mile of new apartment buildings, houses, and stores. Most seem to have been built in the last three years--at least by the appearance of the landscaping. We noted lots of traffic jamming the roads. Saturday dawn started with a bit of sunshine before a cloud deck rolled in for the rest of the day. In the photo above, this is the view towards the operators 304 km away at Monticello, MN (northwest of the Twin Cities). In the photo below, this is the view towards NT0V at Devils Lake, ND--about 195 km away. 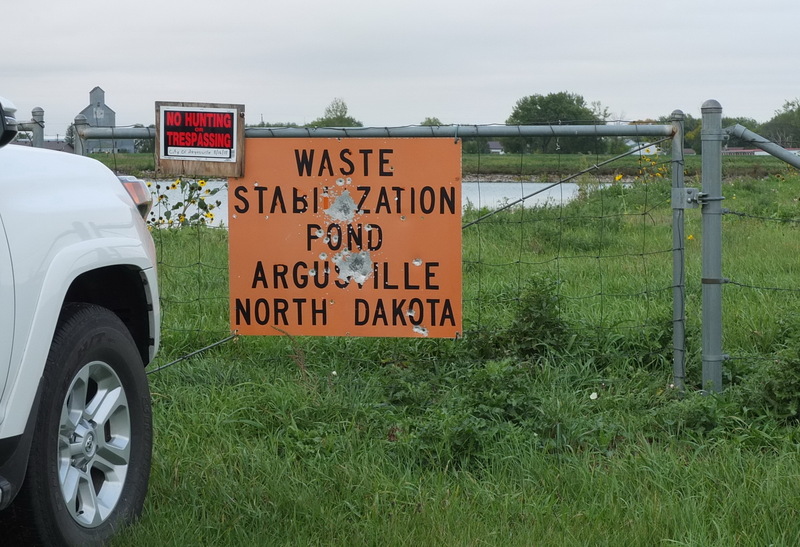 Our second stop on Saturday was near Argusville, ND. Fortunately, there was no odor from the pond. We worked our way northward towards Grand Forks, ND by paralleling I-29 on local roads. 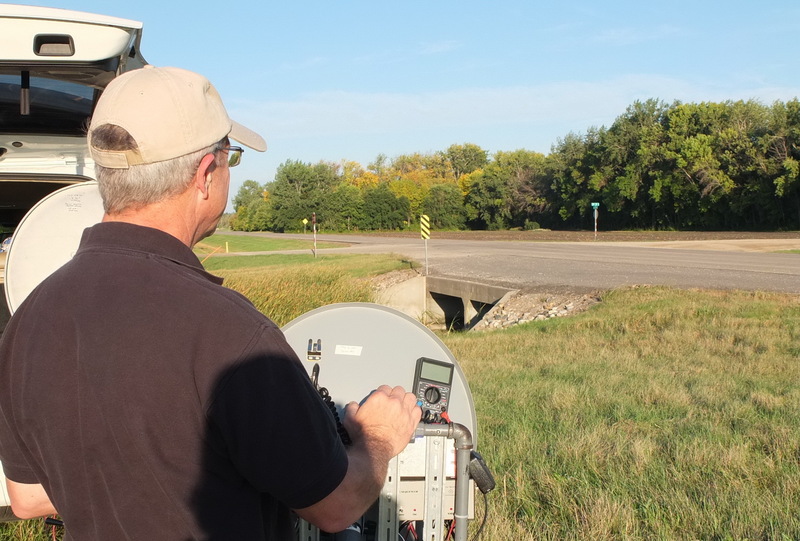 In the photo below, you can see the one overpass over I-29 that we used. Overpasses give a little altitude over the terrain, but we noticed more wind and significant highway noise. The cloud deck kept the temperature pleasant all day. The wind, while present, wasn't too bad. We activated six spots on Saturday and stayed busy all day. Conditions were pretty good. We rarely had to switch to CW--most signals were easy SSB strength. Saturday night, we met up with Donn WA2VOI and Jerry (Grand Forks local) for dinner. Sunday morning dawned sunny and the forecasted high winds had already begun. We went just west of Grand Forks, ND to operate on the dike berm that was built after the big flood in 1997. In the photo above, we are aimed straight north to Barry VE4MA. In the photo below, we are blasting right through those trees to Dennis NT0V only 127km away in Devils Lake, ND. We worked our way southward on roads that were about 20 miles west of the path we used Saturday while coming north. We activated 9 spots and tended to travel about 20 miles between operating locations. This meant that we finished the day south of Fargo. The last few spots were actually tracking eastward about 30 miles south of Fargo. Sunday, the winds were howling all day. Steady at 30 mph with gusts into the 40's. Also, it was hot! The temps were 90 to 94 (Fahrenheit) from noon onward. The wind made the temperature bearable and kept the bugs under control. The high winds meant we had to hunch with our backs to the wind, with the microphone tucked in on the downwind side, to minimize wind noise going out over the microphone. As we passed through Mayville, ND, we noted a disc-golf course that we'd like to return to and play. We had a picnic lunch in the little town of Clifford, ND. Their picnic pavilion had two solid side walls to gain some respite from the wind. In the photo above, we have located on a "Minimum Maintenance Road" east of Hatton, ND about 5 miles (EN17ip). 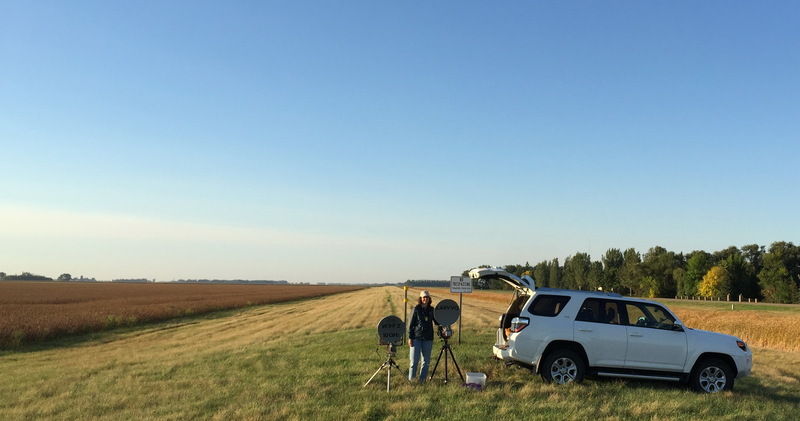 In this photo, our dishes are aimed to the northwest and NT0V. In the photo below, we are looking straight north towards VE4MA. We positioned the car so we would get maximum blockage from the wind. We think conditions were pretty darn good! 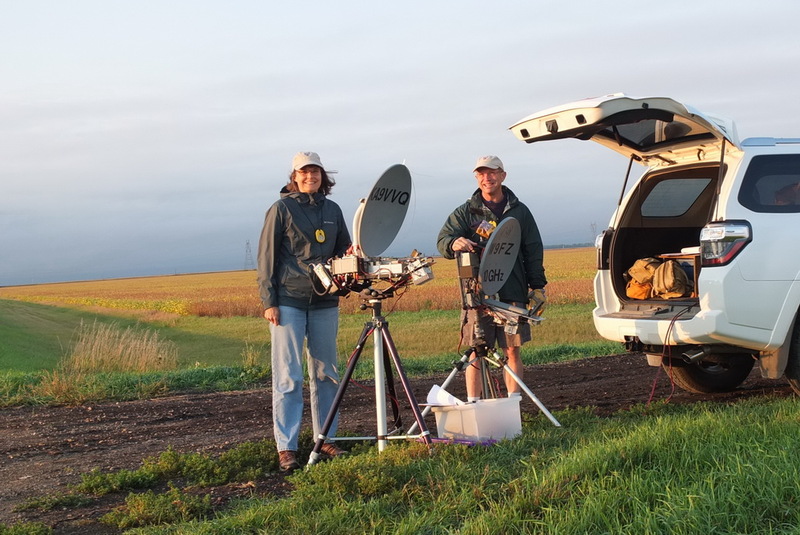 No rain enhancement, yet we made many SSB QSOs over 300km. For instance, our paths worked with VE4MA were (in km): 338, 310, 297, 278, 259, 241, 218, 246, 280, 316, 339, and 352. With Monticello our Q's were (in km): 304, 315, 324, 341, 354, 367, 338, 326, 308, 287, and 284. Our long distance QSO for the weekend was 367 km from EN17lq to EN35cg. We appreciate all the contacts with the other rovers--generally they were pretty easy because they were fairly short distances. I captured a graphic from aprs.fi showing our route. We came into Fargo from the lower right on Friday night. Saturday morning we started at EN16lt and worked northward along the right side of the graphic. Sunday we worked southward on the left side of the graphic. Monday morning we checked out downtown Fargo and found things to visit on our next visit. I whipped up a graphic showing the paths we worked. These were just the ones that Janice and I made. When you consider the other two rover groups working the fixed stations, there was a BUNCH of RF flowing around the region. Especially of note, visualize the path from VE4MA to Monticello (multi-op hill)--they had a rainscatter QSO on Saturday evening. 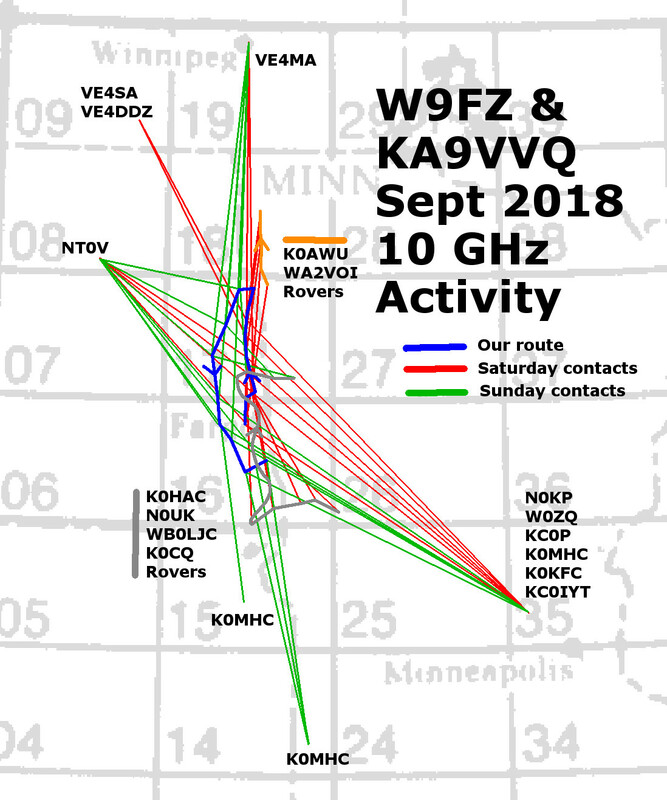 Another long one of note was K0MHC--near the bottom of the graphic--worked VE4MA on JT4F. We had a great time and made a bunch of contacts. We made 138 contacts each. We had two full days of activity. We had a bunch of activity thanks to OTHER operators willing to play "radio". Thank you to all of you! This was a good year of activity. Next year, new adventures await!